Much has been written about the Munsell Color System. The system configures a solid sphere used to unite the three attributes or qualities of color: Hue, Value, and Chroma (HVC). 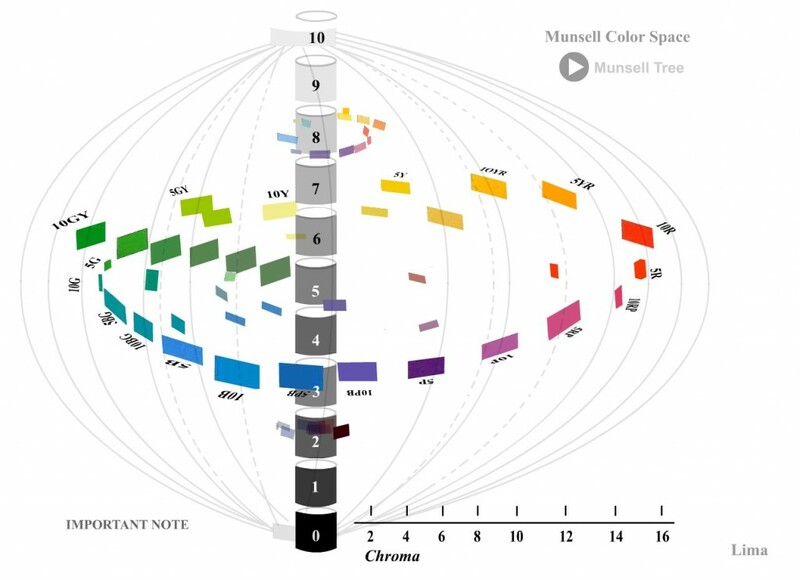 How about studying the Munsell Color System on interactive animated images? My intention when I started making animated figures of the Munsell Color System was simply a way of learning its elements, how it works. So, by way of constant repetition, simply study and learn the system, and then repeat it whenever I wanted, and repeat… and repeat… and continuous learning from the images, until my perception of visible differences in hue, value and chroma, from life-local color, was greatly improved. The Images & Movements from these Munsell Color Studies, aroused great interest worldwide and encouraged me to continue. Virtual interaction was just a natural evolution for these studies. By introducing the possibility to interact with the image revealed its potential as a teaching instrument of great range. Its everyday use, constant repetition and training, produces a heightened perception of even small changes in color. It is my conviction that if one’s concentrates and carefully interacts repetitively with the images, learning curve becomes a smooth and enjoyable task, due to its pedagogical and leisure nature. After some practice, even small differences in color changes are perceptible. Munsell Color Space – colors are located at the surface and inside a circumscribed three-dimensional space, called Munsell Solid. The solid does not reflect a perfect geometric spherical shape due to differences in maximum radial chroma of the colors. Its parallel circles are perpendicular to meridian lines in equal perceptual steps. The equator parallel is the most important and is the central hue point of reference. Munsell color space model is the best way to identify and understand the relationship between colors. 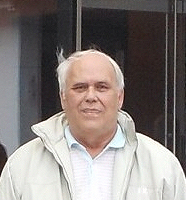 For example, if an artist wants to elaborate in the identification of a color based on the color of a blob of mixed paints on the palette, it suffices to compare it with a similar hue chip-sample inside the space (Munsell Book) to verify where it is located, how it compares with similar neighbor hues of the same family of color, and define precisely its Hue, Value and Chroma. By touching its surface and then skipping inside, and travelling in all directions in the interstices of the space, it is apparent that hue (the quality by which we distinguish one color from another) orbits in circular steps, around a vertical axis of neutral gray value scale (vertically graded 0 to 10, in a gradient from black to white). Around this gray scale, hue changes its value in a vertical manner becoming lighter or darker. Also, starting on the central gray value scale, and stepping horizontally towards the surface of the space, hues gradually change from gray to full chroma (intensity or purity of the color). 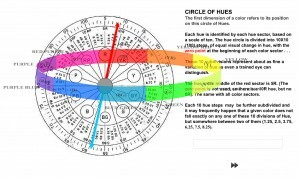 Hue, Value and Chroma are the main qualities of color defined and organized with great mathematical precision by Munsell in the Color Space. Everything inside the space teaches you how to understand the relationship between colors and how they are organized. It is fascinating to understand how hue change its value influenced by the neutral scale in such a way that hues are lighter or darker, depending of its relative matched value position; It is also fascinating to infer how hue increases in chroma departing horizontally from its central value in equally perception steps, attaining maximum chroma at the periphery of the circle, and then decreasing towards the central gray value axis (gray color). To clearly understand the concept of Images, Movements & Interactive Munsell Color Studies, follow the links: Hue, Value, Chroma and Test With Virtual Munsell Chips. Oriane Lima is an MD, PhD and Painter whose interest in the Munsell Color System was largely inspired and triggered by the intelligent approach on the subject taught by Graydon Parrish, Dave Corcoran, Steve Linberg and Richard Murdock from Rational Painting and David Briggs and The Dimensions of Color. You can learn more about his interactive system here Munsell Color Studies and Art and view his artwork on his website, www.orianelima.com.